Things you can use: laundry detergent, dryer sheets, antibacterial gel, baby powder, baking soda, vinegar, cat litter, nylon stockings, water and a washing machine. Place a dryer sheet of your choice in each of the shoes and let them sit like that overnight. Hopefully, on the next morning when you remove the dryer sheets, the horrid odor will be gone, and your shoes will smell all fresh and nice once again. Once you take off your smelly shoes, sprinkle them inside with baby powder generously. The powder will help absorb the perspiration and moisture and will help eliminate the bacteria and the odor it creates. This is a very quick and easy method to use if you want to get the stench out of your gym, running, work or other shoes now! Remove the insoles and the laces of the shoes to wash them separately. Put each or both shoes in a pillow case in order to avoid them damaging the washing machine and wash them in a cold or a gentle cycle with some laundry detergent. Hand the shoes, laces and insoles or leave them in an area with sufficient air circulation, so that they can dry properly and completely. Don’t be tempted to quicken the drying process by placing them near a heat source or under the direct sunlight, because they can become deformed, damaged, cracked or can lose their color. Do not wear your washed shoes until they are absolutely dry in order to prevent the growth of yet new and possibly smelly microbes and fungus. Use your antibacterial hand gel to kill off the microbes and the smell they emit from your shoes. Simply apply a thin layer of the gel on the inside of your shoes and along their soles. Let them dry overnight or dry completely until they smell all fresh and nice again. This is a great method to not only eliminate the smell, but to make certain that the microbes emitting it are killed off as well. Baking soda can be used for removing unpleasant odors from your fridge, carpets and upholstery, so why not use it to remove the smell from your stinky shoes too? Generously sprinkle the baking soda inside your shoes and let them sit like that overnight or for as long as necessary for the baking soda to absorb all the nasty odors and any perspiration in your shoes. Hopefully, on the next morning – the smell will be gone, and the shoes will feel and smell all nice and fresh once again! Distilled white vinegar is another natural solution for removing the pungent stench from your shoes. Mix two parts lukewarm water with one part white vinegar in a bowl or spray bottle and apply it to the inside and outside of the shoes. Vinegar is an excellent anti-microbial and cleaning solution which you can use for cleaning of any part of your home, clothes and other items. The same goes for the shoes. Let them dry off, and then if there is still a vinegar smell, you may need to rinse them off with water and a mild detergent or just pop them into your washing machine for a good scrub. After they are dry your shoes will smell as fresh as ever! Pour some (unused of course) cat litter in a pair of old socks or stockings. Place them in each shoe, so that the cat litter can absorb the perspiration as well as the nasty smell, just like it does when used in a cat litter box. You can use this as a preventive measure against the growth of microbes and fungus in your shoes. Just place a cat litter filled sachet in each shoe each time after you wear them. This will allow them to stay all fresh, germ free and smelling nice over time! You need to take regular care of your footwear in order to prolong its longevity, reduce the risk of development and growth of harmful bacteria, fungus and odors, and so that your feet stay healthy when you wear it. Make sure you let your shoes dry and air out completely every time you wear them. You should regularly remove the insoles and thoroughly wash them or at least let them dry separately before placing them back into the shoes. Use one or more of the above-listed methods, and you will never need to cope with horrible smelling shoes again! 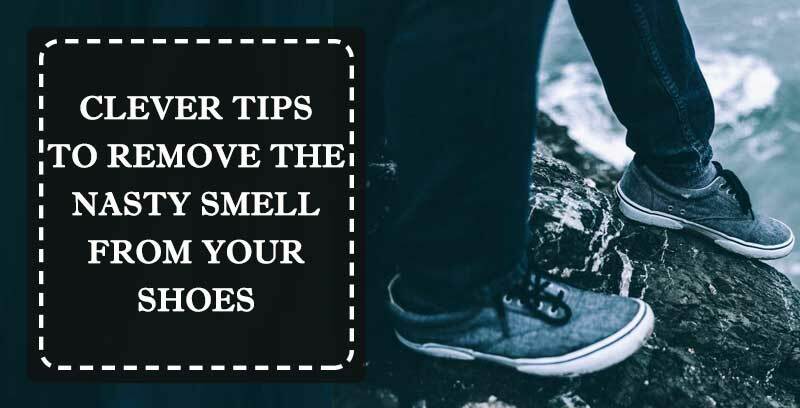 The best way to keep your shoes fresh and odor free is to regularly perform a combination of these methods. This will ensure that you wear your shoes for longer and that your feet stay away from fungal infections, athlete’s foot and other possible health problems due to microbes and fungus in the shoes.